Jesus never told poor people to seek after earthly riches. Jesus told certain rich people to give up all their earthly riches. Jesus told all people to seek after heavenly riches. God’s Message tells us all to learn to be content. I have come to believe that God’s call to contentment is one of the most critical spiritual concepts we have most consistently ignored. When I was younger, I found myself easily intimidated by people. Perhaps it was from being the baby of the family, but it didn’t take much for me to feel “less than” another person whom I perceived to be have some kind of power or authority. Along life’s journey God has placed me in positions in which I’ve interacted with people at many different levels of worldly power and authority. I’ve worked with people in extreme poverty and have dealt with people of extreme wealth. I often work with both front-line employees fresh out of college starting their careers as well as Presidents and CEOs. I’ve had the opportunity to know leaders of business, well-known authors, and government officials. One of the lessons that these experiences have taught me is that every person, no matter their position in life, has their own set of troubles, trials, and temptations. Means and influence do not make you a better person, and often I’ve observed how they create more problems. I’ve known some individuals in relatively impressive positions of earthly power and influence who are deeply insecure, while others with little or no earthly power and influence have incredible personal strength. My experiences have made me far less likely to be intimidated by others. I am constantly reminded that God instructs me to be content, keep growing and be fruitful where I’ve been planted. Others may have more worldly power, more influence, more stuff, and greater means than I do, but in God’s economy we all stand on equal footing. 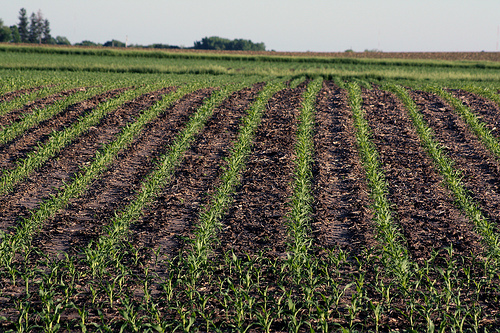 It is spring in Iowa and as I drive down the highway I can see the perfectly planted rows of corn and soybeans emerging in bright green dotted lines on a canvas of thick, espresso and black soil. Farmers have planted their fields wisely to get as many seeds in each row and as many rows in each field to ensure, God willing, a high yield and a measureable profit. Come harvest, they will gather as much grain as they possibly can for market. I found it an interesting contrast to read God’s command to the farmers in the days of Moses. Poverty was as much a social issue and economic reality for people in the days of Moses as it is today. What I find fascinating in today’s chapter is that God’s prescription was for individuals to take personal responsibility for giving of their own means to the poor in their own community. The farmer left some of his field unharvested so that the poor in his community could eat and have a little to trade for their needs. There was a direct transaction of goods between people who knew one another and lived together in community. I also note that God did not command the farmer to harvest the crop and give some his profits to the poor, not did he command Moses and his cabinet of elders to take grain from farmers and administrate a system of distribution among the poor. The crop was left standing and the gleanings left so that the poor had to go to the field and do the work of harvesting it for themselves. It was a constant reminder to those of fewer means that the harder they worked, the more they had to eat and trade. There were no food stamps in the law of Moses, only food available for those who were willing to do the work to harvest it. We wouldn't have a healthcare problem, were it not for these bodies slowly returning to dust. We wouldn't have war, were it not for hatred, prejudice, covetousness, and pride. We wouldn't have a welfare and poverty problem, were it not for selfishness, greed, sloth and corruption. We wouldn't have divorce, were it not for self-centeredness, resentment, brokenness and infidelity. We wouldn't have an problem with obesity or STDs, were it not for appetites out of control. We wouldn't have tragedies, were it not for poor choices married to imperfection. We wouldn't be lost if our own imperfect actions, words, choices, thoughts, and motivations hadn't brought us to this place.